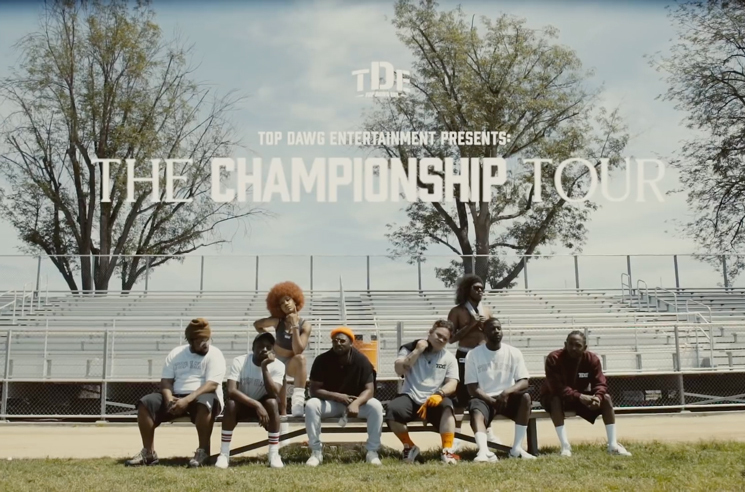 Even some conspicuous absences and a severe case of swollen vocal chords could not kill the victory lap vibes of Top Dawg Entertainment's loaded "Championship Tour" as it hit full gallop down the stretch. Franchise banners advertising TDE's gold and platinum plagues hang from the rafters. Oversized trading cards depicting recording artists as sports heroes flash on the backdrop. A boxing-style announcer welcomes each act to the stage over a loudspeaker. Jock jams like Queen's "We Are the Champions" blare during beer runs and pee breaks. All of which drill home a well-executed theme. And the whole shebang ended, of course, with a knockout punch. A diminutive wordsmith standing tall against a gigantic LED screen broacasting his updated nickname, "Pulitzer Kenny," Kendrick Lamar kung-fu kicks his way through an hour-plus series of smash hits — critical, cult and mainstream — as the crew show's undisputed headliner. Opening with the relentless "DNA" off the 2017 Grammys' Album of the Year, Damn, dipping through back-catalogue winners "Swimming Pools," "Backstreet Freestyle" and "Alright," and reaching climax with "Humble," the celebratory feel of Lamar's routine felt anything but. Twice, he ran back "Humble," first allowing the thousands gathered outdoors at Budweiser Stage to chant his verses for him before closing the ceremonies himself. Can you blame Kenny for soaking in his moment on a warm summer's eve by the lake? As the breakthrough star of low-key CEO Anthony "Top Dawg" Tiffith's "little indie that could," Lamar is that rare 2018 MC who can seemingly earn your head nods and your respect with ease, even if he's kicking like mad under the surface. So what if Lamar, rap's reigning champ based on pen and tongue skills, had already performed the majority of the same set in the same city less than ten months ago? So what if his contributions to this jam vastly outweighed the combined efforts of all his undercards? Kendrick is to California's TDE what LeBron is to the Cleveland Cavaliers: King. Before crowning the T-Dot "one of my favourite motherfuckin' places in the world," K-Dot asks rhetorically, "Is anybody alive right now?" He couldn't be more so. There's a flip side to such dominance, however. Early appearances by support acts like excellent R&B crooner SiR and respected Watts rapper Jay Rock (making his Toronto debut) were annoyingly brief. Lance Skiiiwalker got one song. Ab-Soul, the crew's oddball act, has been dropping studio LPs for seven years but was restricted to less than 15 minutes of shine. Instead of The Championship Tour feeling like a sincere family reunion, its staggered rollout was frustratingly light on live collaborations, and the exclusion of Isaiah Rashad should raise eyebrows. That the rare exception — Jay Rock returning to the dais for the remix version of Lamar's still-banging "Money Trees" and hanging around for "King's Dead" — yielded palpable excitement made it all the more curious that there wasn't more stage-sharing. Despite shoutouts to all the "Day One fans," not once were we gifted a Black Hippy cypher. Maybe we're nitpicking, but ScHoolboy Q performing "Collard Greens" and Jay Rock rhyming "Vice City" (a personal fave) solo when Lamar is backstage were missed shots. The second obvious drawback of an otherwise wonderful night was the lack of SZA. The R&B sensation is poised as the label's best chance to cross over, a momentum underscored by the radio run of her Lamar duet "All the Stars," but she had to beg off the tour due to swollen vocal chords. Scary. In SZA's absence, mean-mugging gangsta rapper ScHoolboy Q set the stage for Lamar with what is rapidly becoming a bulletproof set list featuring "Break the Bank," "Studio," "That Part" and the irrepressible "Man of the Year." In keeping with the sporting aesthetic, each member of the team represented a different athletic pursuit. Fashioning Q as the country-club golfer — complete with motorized cart, white polo, and Tiger Woods celebration video montage — was a stroke of genius. The Championship Tour's 29-stop North America romp wraps Saturday, then it's back to the lab for Pulitzer Kenny and friends. Jay Rock and ScHoolboy each have new albums dropping this summer, and it's safe to say Lamar — cast on this night as a Formula 1 race car driver — will be speeding right behind. Order the Lamar-curated Black Panther: The Album, featuring Jay Rock, Ab-Soul, Lamar and more, on vinyl and CD via Umusic.